I’m the type of person who thinks about dinner as I am eating breakfast. So, it may not be surprising that I ponder what to cook for the newspaper column I write up to a month in advance! Aside from deadlines well ahead of the publication date, I like to think ahead to seasonal ingredients and holidays while offering an assortment of recipes, from soups to salads, seafood to eggs. I try to include a similar balance in this space. While I realize I won’t please everyone all the time, my hopes are that a variety of recipes will at least please most of the readers most of the time! For my most recent column, I was prepared to present a creation that is a cross between a frittata and a quiche when it occurred to me that the article would go to print on Memorial Day weekend. (Where does the time go, by the way?) Quite frankly, something grilled seemed more appropriate for this weekend than a baked egg dish! In the spirit of variety, my brother-in-law once kindly mentioned that my column was a little short on red meat. So, I am dedicating this juicy, Asian-inspired flank steak to him. The recipe may be prepped the night before and simply tossed on the grill when ready to eat. For a novel appetizer, follow the instructions for the skewers or, as my family calls them, steak-on-a-stick! The steak may be marinated overnight or for as little as four hours. The end result is delicious either way, although the flavor will be slightly more pronounced with the extended soak. The flank steak pairs well with a side of rice and steamed broccoli, and I soon plan to share a much-loved noodle recipe as a delicious option to round out the Asian theme and a convenient make-ahead salad when entertaining…stay tuned! Yields 4-6 main dish servings, more if serving as a hors d'oeuvres. In a small bowl, mix together hoisin sauce, sherry, soy sauce, honey, green onions, garlic, and ginger. For skewers, cut flank steak across the grain on a diagonal into 1/4 inch slices. Freezing the steak for 15-20 minutes will make it much easier to slice. Set a timer if you think you may forget to retrieve it before it freezes completely. Place slices in a 1 gallon, resealable plastic bag. Pour hoisin sauce mixture over slices, and mix well. Refrigerate at least 4 hours or overnight. Conversely, you may marinate the whole flank steak. Preheat an outdoor grill for high heat. 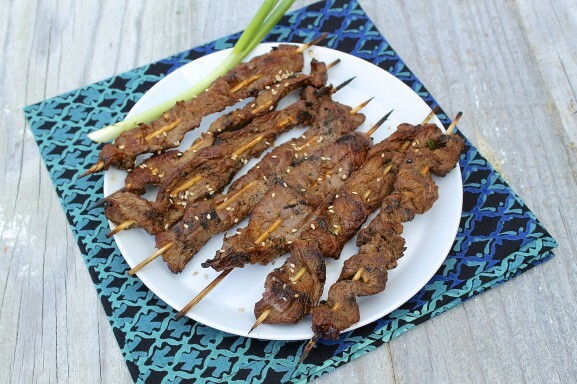 Discard marinade and, if cooking on skewers, thread the sliced steak on the soaked skewers. If cooking whole, allow the steak to sit at room temperature for about 30 minutes prior to grilling. Over high heat, grill skewers 2 minutes per side, or to desired doneness. For the whole steak, grill for approximately 6-8 minutes per side for medium rare. This will depend a bit on the thickness of the steaks. (Our last steak was about 1-inch thick and took the higher end of this range.) Flank steak will be more tender if cooked to medium rare. Allow to rest for 5-10 minutes before slicing to allow the juices to redistribute. Then, slice thinly across the grain. Sherry is used to tenderize the meat in this recipe in lieu of harder-to-find rice wine, which is a staple in Chinese cooking. I recommend regular sherry as opposed to cooking sherry, but if you don’t have sherry, you may substitute rice vinegar. I have tried this and the flavor of the finished product is pretty close. Hoisin sauce is a thick, reddish-brown sauce that is sweet, spicy, and widely used in Chinese cooking. It can be found in the Asian or ethnic foods aisle of most large supermarkets as well as in Asian markets. 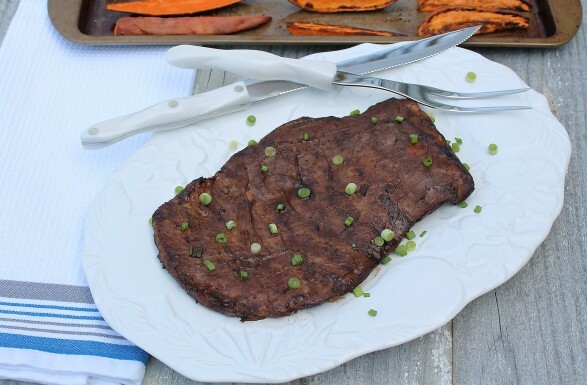 As an option to skewers, simply marinate and grill the whole flank steak. Flank steak is best cooked to medium rare. Once cooked, allow the steak to rest 5-10 minutes so that the juices redistribute, then slice on a slight diagonal against the grain for the most tender results. Thank you, Ally, dear! I wish I could share a whole plate with you right now! Wouldn’t that be fun?? Could you substitute Teriyaki sauce for the Hoisin sauce? I don’t like spicy, but I do love sweet Teriyaki. Please let me know thanks. This recipe really isn’t too spicy. (I actually just tasted my hoisin sauce and it is very mildly spicy.) Mixed in with the other ingredients, any spice is tempered. That said, you could probably make the swap, although I have not tried it to say officially. For another Asian option that we really enjoy and is not at all spicy but is extremely flavorful, you could try the marinade I linked below. I use it often for chicken, but it is delicious on flank steak, too. If you do make this recipe using teriyaki, let me know what you think!